In recent years, terms such as gut health and microbiome seem to have just dropped into our vocabulary. Today, poor gut health is often blamed for being overweight, chronic diseases, illnesses, and even our intelligence. Our microbiome—that is, all the microorganisms, including the commensal and pathogenic bacteria in the human body—plays a complicated and important role in many aspects of our health. And the microbiome in the gut is particularly important. How does my burger affect my gut? Choosing the best foods to eat can be confusing. We hear a lot about taking probiotics, prebiotics, kefir and kimchi for better gut health, but food choices may actually be a little simpler. More common foods, such as meats and vegetables appear to play leading roles in the health of our gut as well as our heart. Interestingly enough, the environment in our gut heavily influences how some meat and other animal products are absorbed and digested—and whether we eat more meat or more vegetables influences the variety and number of bacteria we have in our gut and how we respond to the meat we eat. This is where things get interesting. It appears that the type of bacteria we have in our gut determines whether we produce harmful TMAO from L-carnitine and choline. Long-term vegans and vegetarians do not convert L-carnitine and choline to TMAO at the same rate as omnivores. (In fact vegans produce a negligible amount of TMAO. )[ii] And heavy meat-eaters have a different mix of bacteria than those who eat little or no meat and more carbohydrates, particularly vegetables and fiber. The difference is most pronounced comparing omnivores with both vegans and vegetarians. It turns out that the state of our gut bacteria may reflect our risk for heart disease, but the research is still young. We know that we have a lot of bacteria in our gut—in fact, our intestine houses >1014 microorganisms with important functions, and the microbial composition differs along the digestive tract[iii] . And we know that the bacteria in the gut—our microbiome—seem to gather together by type into different groupings or communities, called enterotypes. Diets rich in complex carbohydrates reveal fewer pathogenic species than diets higher in fat and protein. The altered microbiome of vegetarians could also reflect a higher fiber intake and the presence of more short-chained fatty acids (SCFAs), which are produced when intestinal bacteria metabolize indigestible carbohydrates (fiber). SCFAs regulate immune function, hormone production and formation of fats; they also decrease the pH in intestines, thus preventing the growth of potentially pathogenic bacteria such as E. coli. Vegans appear to have the lowest levels of TMAO even after L-carnitine; therefore, increased vegetable and fruit intake relative to red meat may be the simplest and safest recommendation for reducing TMAO levels. When you have a healthy microbiome, eating small amounts of red meat and animal fats may not have the same negative effects. Looking at several different aspects, a healthy gut reflects long-term diet choices toward more vegetables, fruits and whole grains and less red meat and animal fats. So, for a happy gut, reach for the veggie burger! 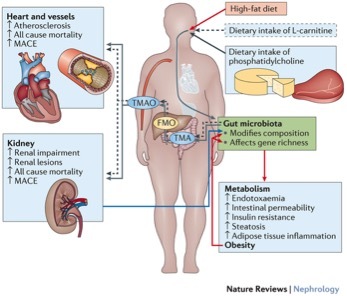 [ii] Koeth R.A., Wang Z., Levison B.S., Buffa J.A., Org E., Sheehy B.T., Britt E.B., Fu X., Wu Y., Li L. Intestinal microbiota metabolism of l-carnitine, a nutrient in red meat, promotes atherosclerosis. Nat. Med. 2013;19:576–585. [iii] Fouhy, F., Ross, R. P., Fitzgerald, G. F., Stanton, C. & Cotter, P. D. Composition of the early intestinal microbiota: knowledge, knowledge gaps and the use of high-throughput sequencing to address these gaps. Gut Microbes 3, 203–220 (2012). Becky Ramsing, MPH, RD, LDN, joined the Center in 2016 as a senior program officer and is primarily responsible for managing the Center’s technical advisory role with the Meatless Monday Campaign. Hi, I’m working on a school project for my high school honors biology class, and I was wondering if I have written permission to use your microbiome photos.